Things don’t get any better for the Cardinals in 1903 as they finish 43-94 and are 46.5 games behind Pittsburgh. Mordecai Peter Centennial (“Three Finger”) Brown joins the team and gets his first of many victories but not all for the Cardinals. Brown has only three fingers and is from Indiana where he was a coal miner. December 12, 1903: The St. Louis Cardinals traded Mordecai Brown and Jack O’Neill to the Chicago Cubs for Larry McLean and Jack Taylor. July, 1903: The Chicago Cubs purchased Clarence Currie from the St. Louis Cardinals. June, 1903: The Pittsburgh Pirates purchased Art Weaver from the St. Louis Cardinals. April, 1903: The St. Louis Cardinals traded Bob Wicker to the Chicago Cubs for Bob Rhoads. March 1, 1903: Buffalo (Eastern) traded Dave Brain to the St. Louis Cardinals for Fred Hartman. January, 1903: The St. Louis Cardinals traded Otto Krueger to the Pittsburgh Pirates for Jimmy Burke. Before 1903 Season: The St. Louis Cardinals purchased Mordecai Brown from Omaha (Western). The offense was led by 38-year old player/manager Patsy Donovan with a .327 batting average and 25 stolen bases. Homer Smoot hit .296 and had a team high 4 home runs. Dave Brain knocked in 60 runs and Jim Hackett fanned the most with 56 whiffs. The team batting average was .251. 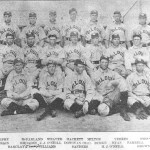 Pitching was led by Chappie McFarland with a 9-19 record and 25 complete games. Mordecai (Three Fingers) Brown was 9-13 with a 2.60 ERA on the season. He also fanned 83 batters.